Orchid Update September 2: Here is our mystery summer blooming Cymbidium Chen’s Ruby ‘Gold Tiger’. It opened its first bloom in late August and all flowers on the first spike are now open. It has a second spike popping with nine buds as well! The flowers are wonderfully fragrant during the day, a rarity among cymbidiums! I think this one is a keeper for its heat tolerance alone. 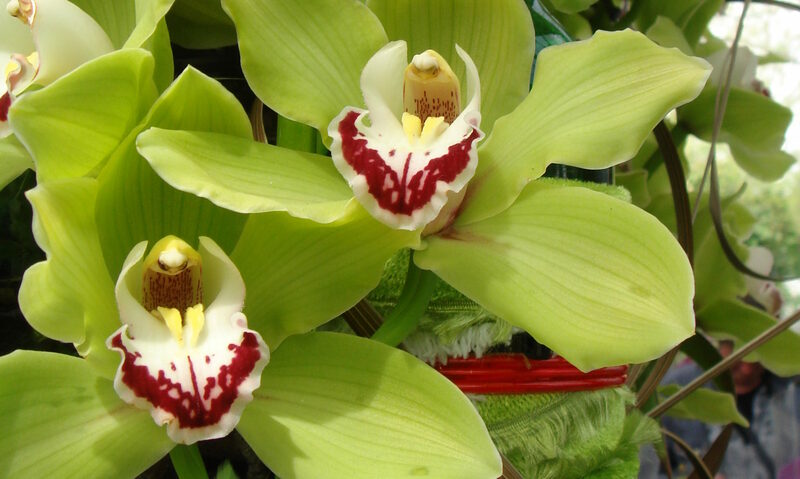 This compact cymbidium orchid seems to be more than just ‘heat-tolerant. In fact, it seems to love the heat! Its produced two spikes of buds during 80-90 degree weather during the past two month in Washington DC. Yes, it is growing outdoors on a balcony where it gets direct sunlight from morning through early afternoon. The buds have fully formed, with no signs of dropping or blasting during the past two weeks when temperatures have pretty much hit 90 degrees every day. The plant last bloomed in October when I purchased it. Interestingly, other growths have young to maturing shoots, so unlike many standard cymbidiums that all produce their new growths at about the same time (and thus all bloom on those same growths about the same time) these will matures at different rates. This means the plant could bloom more than once a year, especially since temperature seems to be less of a factor. I can see this orchid doing this when they get up to size. I know what hybrid this is, and the flowers are stunning, but I’ll keep it a surprise until the flowers open and post a photo then!